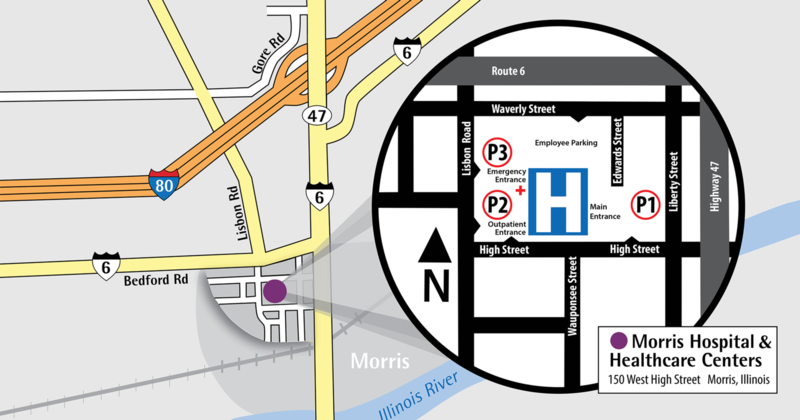 Morris Hospital is located at 150 West High Street in Morris, Illinois – just two blocks west of Route 47. Please refer to the map for the exact location. The main entrance is located off High Street. The Emergency Department entrance is located off Lisbon Street. Handicapped parking spaces are designated. Go South on Illinois Route 47 into Morris. Turn right (West) on High Street. Morris Hospital is 2 blocks ahead on your right. Go North on Illinois Route 47 into Morris. Turn left (West) on High Street. Morris Hospital is 2 blocks ahead on your right. Go West on U.S. Route 6, then left (South) on Illinois Route 47 into Morris. Turn right (West) on High Street. Morris Hospital is 2 blocks ahead on your right. Go East on U.S. Route 6 into Morris. Turn right (South) on Lisbon Street. Morris Hospital is 2 blocks ahead on your left. P1 – Main Entrance Parking: Main parking lot is off High Street on the East side of the hospital. This parking lot is for visitors and vendors. P2 – Outpatient Registration Entrance: Entrance is off Lisbon Street and High Street on the South-West side of the hospital. This entrance is for outpatient surgery, IV therapy and diagnostic testing including x-ray and lab services. P3 – Emergency Entrance: Emergency entrance is off Lisbon Street on the West side of the hospital. This entrance is for emergency services and patient admissions.